Creamy, dreamy spiced No-Bake Pumpkin Cheesecake with pecan graham cracker crust is the perfect healthy fall dessert. It’s easy to make and tastes amazing! Have I ever told you that cheesecake is one of my favorite desserts? Ok, it probably is my favorite dessert. But only really good cheesecake. The kind that’s tall and dense, creamy and not too sweet. The kind my mom used to make for my birthday when I was young. Yes, this dietitian is a huge fan of one of the most calorically dense, notoriously unhealthy foods out there. And I have no shame. Of course, I don’t eat cheesecake often. For one thing, my mom now lives five hours away and teleportation hasn’t yet been invented. And I don’t want to make it myself. Between just my husband and me, we really shouldn’t have an entire cheesecake laying around the house. Also, cheesecakes take forever to bake and cool down to the perfect chilled temperature where slices are easily cut and optimal for devouring. And store-bought just isn’t acceptable. That’s where easy little shortcuts like this No-Bake Pumpkin Cheesecake come in. 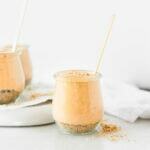 When I have a craving for a little something sweet and indulgent, and I don’t want to spend all day making a cheesecake only to have to wait for it to chill overnight, I know I can easily whip up one of these creamy, healthier cheesecake cups for a quick fix. 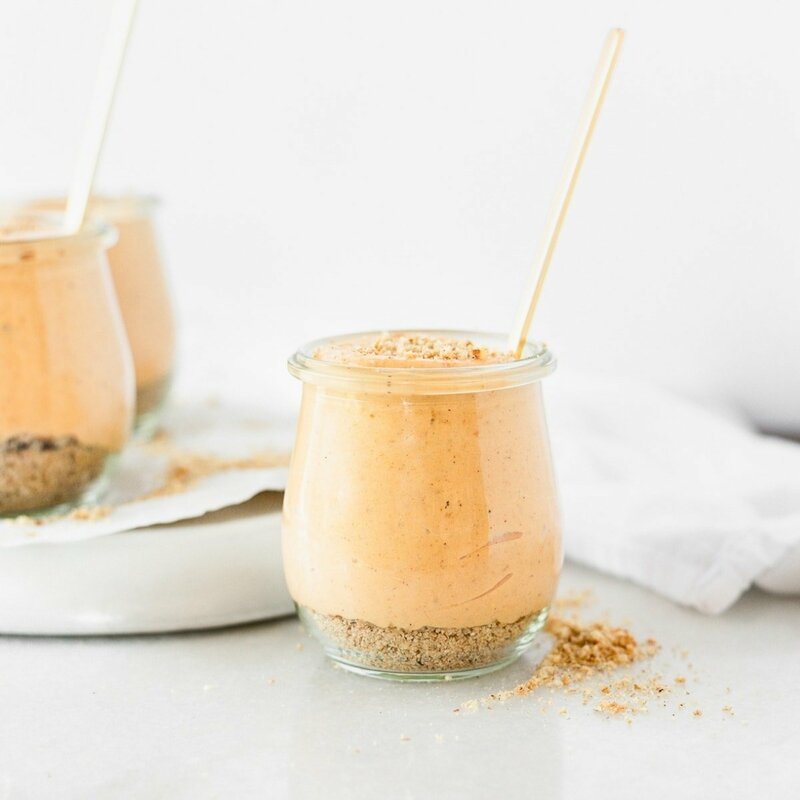 Since it’s fall, what better way to utilize pumpkin than in a lightened up, creamy, no-bake version of my favorite treat? 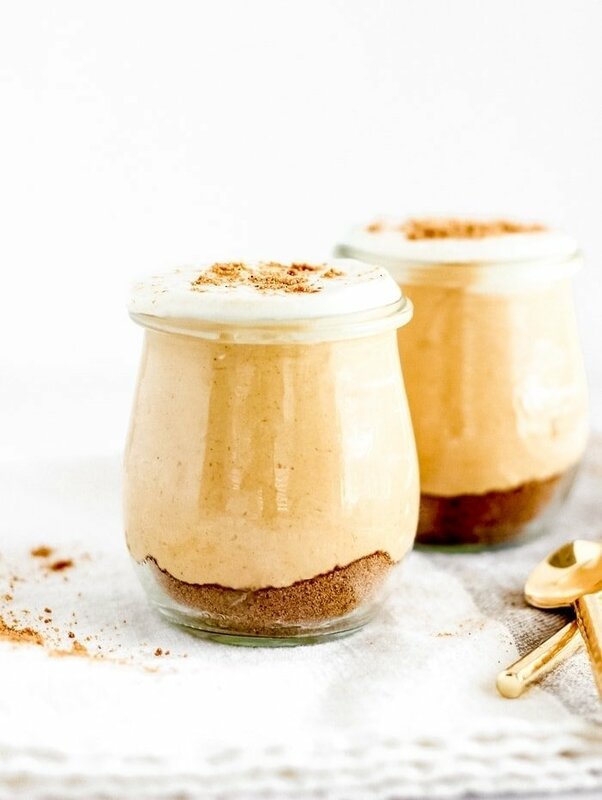 I love that these No-Bake Pumpkin Cheesecake cups feel indulgent, but they’re made with healthier ingredients like real pumpkin, Greek yogurt, and light cream cheese. And they only take a few minutes, a few ingredients, and your mixer. Don’t forget about the delicious crust. In this recipe it’s made with graham crackers and pecans, which provides a tastier version of classic cheesecake crust. If you have them, though, you can use gingersnaps in place of the graham crackers. They go so well with the spiced pumpkin filling for an even more festive fall treat! Don’t skimp on the pecans! They add a nice crunchy texture and perfectly round out the dessert. 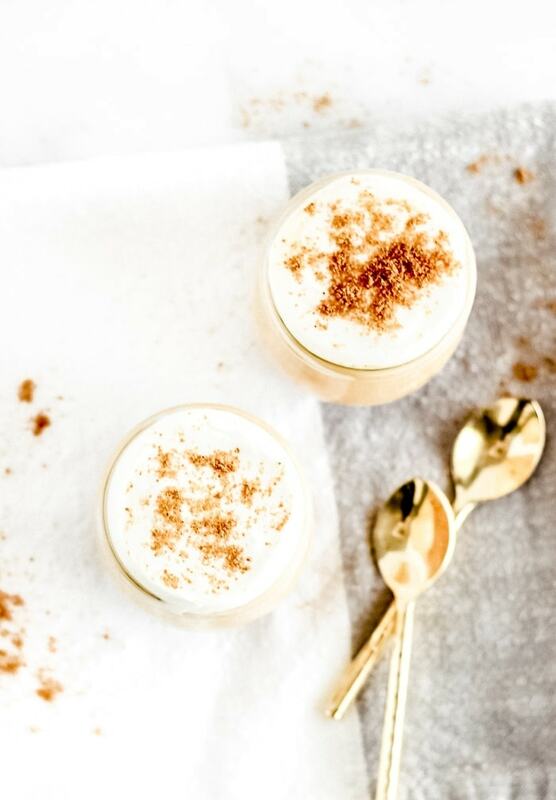 Next time you’re looking for a healthier, quick-fix fall dessert, reach for one of these delicious No-Bake Pumpkin Cheesecakes! You get all of the fun fall flavor with less waiting and more nutrients! 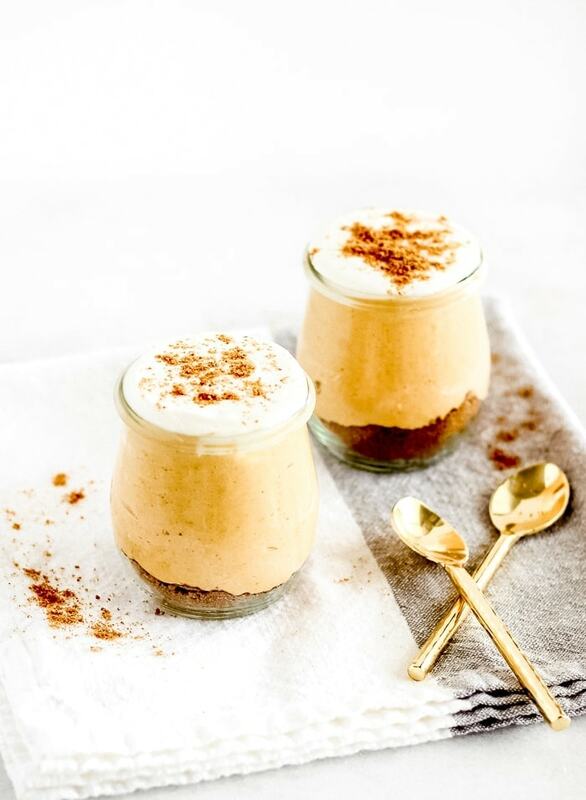 Creamy, dreamy spiced No-Bake Pumpkin Cheesecakes with pecan graham cracker crusts are the perfect healthier fall treat. They’re easy to make, healthier, and taste amazing for fall! In a food processor or Nutribullet, blend graham crackers and pecans until they form crumbs. Set aside. In the bowl of a stand mixer or in a large bowl with a hand mixer, beat together filling ingredients until smooth and fluffy, about 5 minutes. Place in the refrigerator to chill for at least 30 minutes. To assemble cheesecakes, spoon crust into the bottom of 8 dishes. Divide filling among dishes and top with whipped cream (optional). Return to the refrigerator until ready to serve. They will taste better the longer you chill them.